Her spirit of work is best illustrated by her remarks upon Sir Herschel's portrait. 'When I have had these men before my camera, my whole soul has endeavoured to do its duty towards them in recording faithfully the greatness of the inner man as well as the features of the outer man. The photograph thus taken has been almost the embodiment of a prayer.' 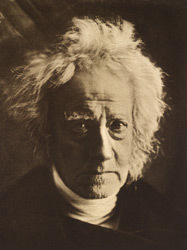 Sir John Herschel watched every step in his friend's career, often writing to warn her of the deadly powers of 'cyanide.' His criticisms on her works too were full of innocent praise and kindly sympathy, if futile as art-appreciations."